One of the biggest original song contests in Ireland, the Clancy Brothers Songwriting Competition 2016, is now open for entries. And with a prize fund worth over €5,000, this is a competition designed with the songwriter in mind. First prize includes €500 cash, studio time at Crossroads Recording in Kilkenny, cd duplication from Duplication Ireland, and a design package from InMusik. With these prizes the winner will have all they need to record and produce a professional quality CD. The free to enter competition and is open to all musical genres and styles, all ages and all nationalities. As long as it is a song, it is eligible for entry. Songs are judged on melody, composition, originality and lyrics, not on performance or production skills. The competition is easy to enter, either by sending an MP3 by email or a CD by post. The three finalists will perform their song at a concert on Thursday 2nd June during the Clancy Brothers Festival of Music and Art 2016 as part of a 15 minute set, after which the winner will be announced. The two runners up also receive cash prizes and a design package from InMusik so no one leaves empty handed. For full details please go to www.cbsongwriting.com. Entries can be posted on a CD to Clancy Brothers Songwriting Competition, 42 Main Street, Carrick-on-Suir, Co Tipperary, or emailed as in MP3 format to cbsongwritingcompetition@gmail.com. Entries must include lyrics. Please read rules before entering, for full details please go to www.cbsongwriting.com. 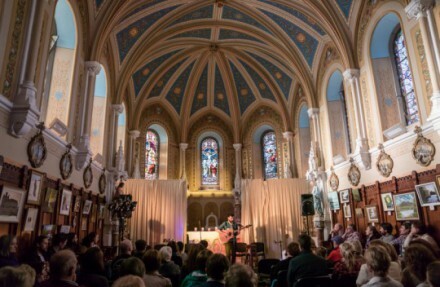 Jamie Mulrooney, 2015 Winner of the Clancy Brothers Songwriting Competition, performing at the final concert in the Nano Nagle Chapel, Carrick-on-Suir. (Photo credit Patrick Lyons). This entry was posted on March 2, 2016 by waterfordarts in Arts Opportunity, music and tagged Clancy brothers festival, Clancy Brothers Songwriting Festival 2016, song writing competition.